Imagine for a moment you are looking at a castor: It has a certain size and height. However, this later measurement depends on an intelligent overall design. In hospitals especially, this is particularly important, since safety considerations dictate that the height of the castor fitting should not be more than the castor diameter. It’s impossible really to retain the ideal wheel size and at the same time reduce the height – in theory, at least. But, in fact, we have managed to do so and, in the process, have supplied our customer Stegelmeyer with the TENTE Linea. 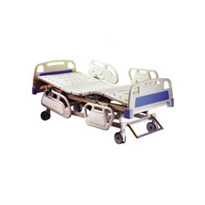 The Stegelmeyer Group specialises in the manufacture of hospital beds. 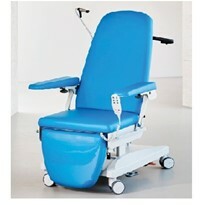 Their portfolio additionally includes hospital furniture. 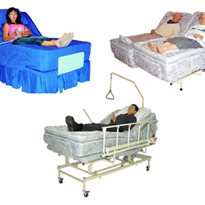 In hospitals, it is important to enable a low mattress base position to be set to enhance patient safety. Falls can have serious consequences, particularly for people of an advanced age. 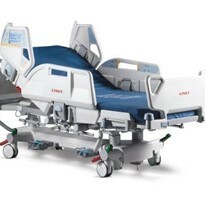 To reduce the risk of injury, hospitals rely on beds whose mattress bases can be lowered substantially to a low height level. Half of all patents in hospitals are over 65 years old. It is to be expected that this trend will continue to increase in view of demographic change. This makes fall prevention a crucial factor. 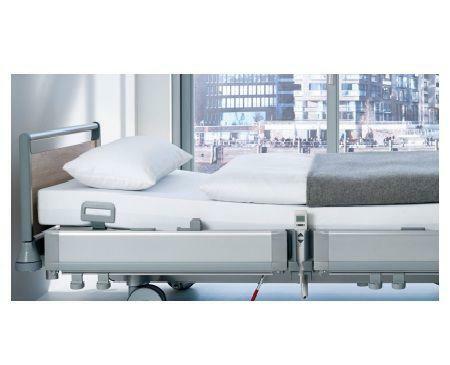 Stegelmeyer developed the Puro hospital bed which enabled nursing staff to set the height of the mattress base to a particularly low level. 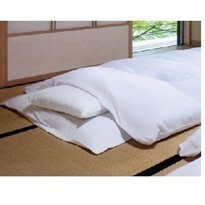 The castors on the bed contribute decisively to how low this level can be. We have been a reliable partner to Stegelmeyer for more than 60 years. 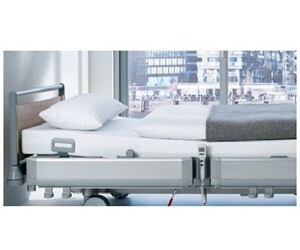 On top of that, we were also able to deliver the ideal solution in the case of the Puro hospital bed: the Linea hospital bed castor. Its outstanding feature is a fitting that is barely higher than the wheel size. With a diameter of 125 millimetres, the total height of the castor is only 130 mm. Safety was just one of the deciding factors when developing the Linea castor. It was also important for our engineers to take the overall hospital environment into account and to focus on all influential factors. 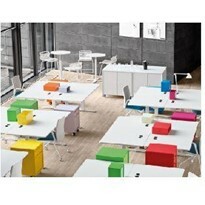 This included the design, hygienic aspects, noise development and the running characteristics. 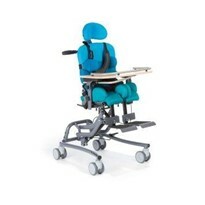 This resulted in the use of two precision ball bearings to allow the castor to swivel exceptionally easily. The central locking mechanism is also maintenance-free. When it comes to the appearance, the colour scheme of the castor can be matched to the adjacent components and the bed frames. The cover in the centre of the wheel offers further options for customising the castor. Additionally smooth surfaces discourage dirt pick-up and are easy to clean. 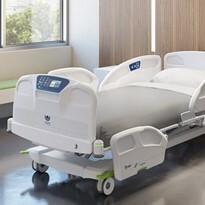 Also since a hospital is primarily a place for rest and relaxation, the castor locking and release mechanism is much quieter than with conventional products. 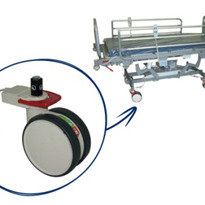 The Linea castor makes it possible to significantly improve the safety of patents in hospitals. 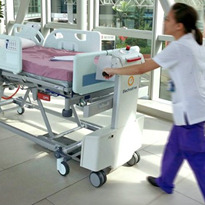 Thanks to its minimal overall height, nursing staff can adjust the mattress base so that it is only 28 centmetres off the ground. 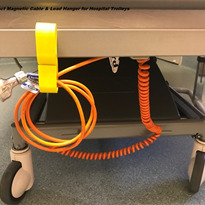 Due to this, the Linea twin wheel castor is making a significant contribution to considerably reducing the risk of injury in hospitals.